Wayne has meetings all day, so we rose early and enjoyed a leisurely breakfast overlooking the river. 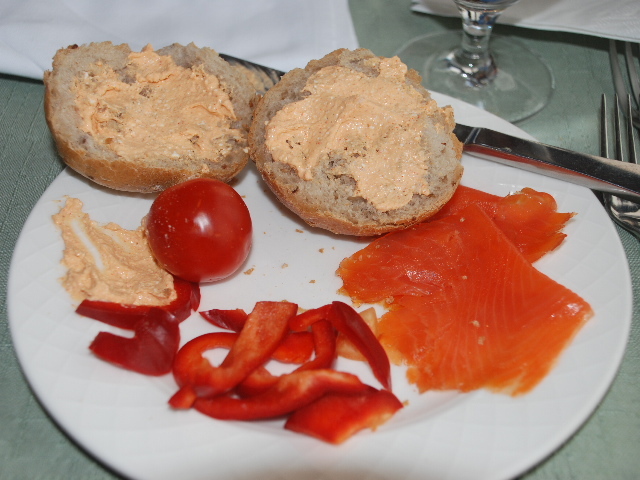 Almost every Hungarian meal contains red bell peppers–paprikash–as they call them. In fact, on Valentine’s Day, they hang huge pictures of red bell peppers on long banners in one of the city malls. In the states, we pay about $2.00 for big, ripe red bell. Here… they are just pennies… Full of vitamin C, they are very healthy. What a lovely breakfast vista, Bonnie. Godspeed for you and your husband and for a safe return. Wayne and I have been a few times to your neck of Europe… Italy. It is actually my favorite. Some people say they have found themselves in Paris… well, I found myself in Italy. But on this trip, it won’t work. Do you go there often? What part is your family from?